What to Consider When Buying a Water Boiler for your Business - Marco Beverage Systems Ltd. The demand for high-quality tea and coffee has grown significantly over the last few years, becoming a market few coffee shops, restaurants, and hotels can afford to ignore. However, this is a demanding industry. From the quality of the raw materials (coffee beans, tea leaves, milk, and water) to the recipe and customer service, every detail matters. And it’s impossible to make high-quality beverages without a consistent and reliable hot water source. Purchasing a hot water boiler is an investment. Selecting the right one for a particular business will improve beverage quality, efficiency and, in turn, customer satisfaction. But what should buyers consider when making this purchase? The Marco Über Boiler in action. Why Invest in a Separate Water Boiler? Good-quality tea needs to be brewed at different temperatures to coffee, meaning the espresso machine is not an ideal hot water source. Additionally, if baristas are using the espresso machine for non-espresso beverages, it means extra work for the machine’s boiler. This may then slow down service as the machine heats more water. This could also result in a shorter lifespan for the machine (which, after all, is probably the business’ most expensive piece of commercial coffee equipment). 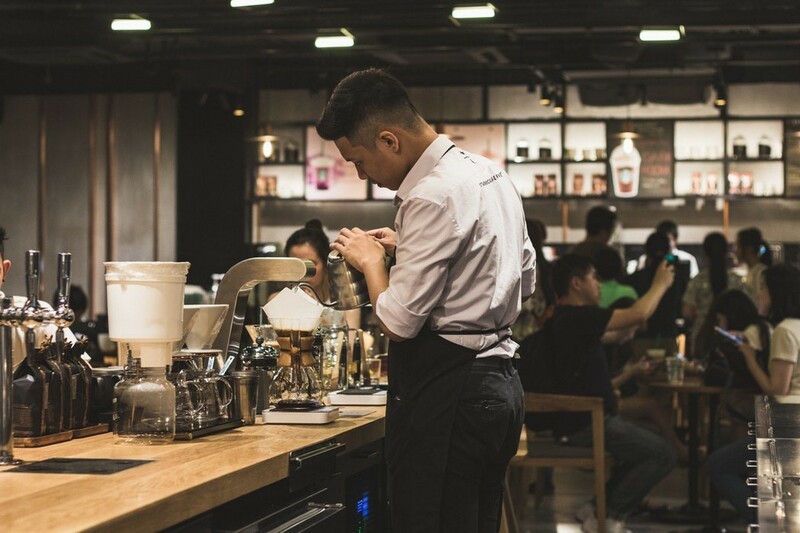 And as the espresso machine suffers the effect of overuse, quality and service time will only decrease further, leaving business owners facing both the expense of repairing or replacing equipment and the problem of dissatisfied customers. However, it’s not as simple as merely picking a hot water boiler. There are many aspects companies should consider first. “It should be simple to use,” Henry stresses. Equipment that is easy to operate saves time. It should also be suitable for all of the business’ needs. 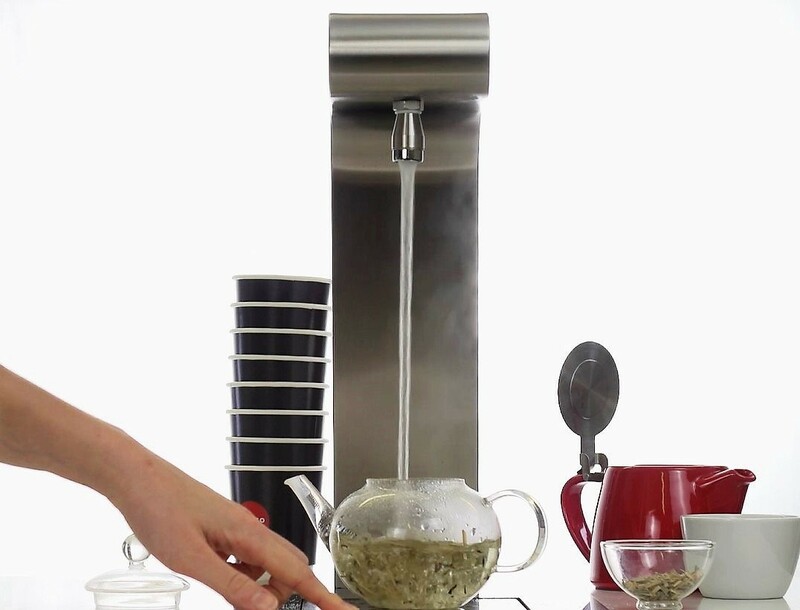 For example, if the business is serving a range of speciality teas, a multi-temperature water boiler like the Marco MIX would be more suitable. High-quality white or green tea is best brewed at lower temperatures than black tea. 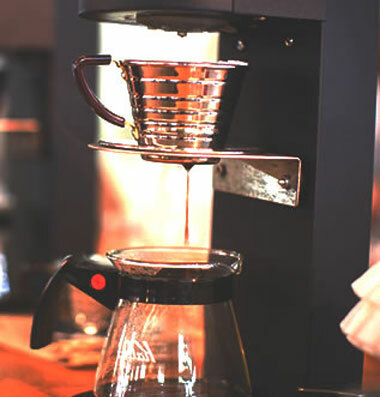 Alternatively, those regularly preparing pour over or manual coffee may prefer something like the Marco SP9: a hot water dispenser and coffee brewer in one, which can work with existing brewing devices such as the Chemex or Hario V60. It ensures that hot water is poured onto the ground coffee at the precise temperature, volume, and time that the brewer requires. Filtration is also crucial for excellence in beverage preparation. Water hardness can affect the taste of any beverage. Coffee prepared with soft water can seem flat or lack body. On the other hand, hard water can lead to sour and dull coffees. Additionally, high concentrations of minerals such as calcium can result in limescale build-ups in the boiler. This can clog pipes and prevent the boiler from heating correctly. Water boilers with built-in filtration systems, such as the Marco MIX, SP9, and water boiler-brewer QUIKBREW, can make controlling water quality even easier for businesses. Products like the Marco Ecoboilers are also designed to be easy to descale, since no filtration system will completely prevent limescale. A well-planned bar layout makes for both a better customer experience and employee performance. Customers know where to go, while employees have room to work and the tools they need close at hand. Henry recommends considering the size of the business and how much hot water will be needed. This should dictate the hot water boiler size and placement. Remember that bulky countertop water boilers can take up valuable working space, slowing down the barista’s work. Henry points out that everything a barista needs should be to hand. It’s a lot harder if staff has to reach around the coffee shop equipment. A few seconds lost here and there might not sound like much, but the customer waiting in line notices every single one of them. At The Gentlemen Baristas, Henry uses a combination of the undercounter multi-temperature Marco MIX boiler and the sleek Marco Über font, which comes with weighing scales for precision in tea and coffee brewing. As a result, his staff have easy access to hot water, sufficient countertop space, and the ability to continue interacting with customers while preparing their drinks. Energy efficiency has a direct impact on operating costs, not to mention the environment. Choosing coffee brewers, espresso machines, and boilers with an energy-saving mode can be a good option. For example, the Marco MIX has a vacuum-insulated tank that allows for up to 70% more energy efficiency simply by preventing heat loss. The Marco Ecoboilers are not just designed to be energy-saving but are also made with 95% recycled materials. Selecting the ideal hot water boiler for a coffee shop, restaurant, or hotel is not always easy. The best coffee equipment will depend on the business’ needs, layout, and more. So, before making any purchasing decision, it’s important to ask: What does this business need? How will this equipment meet those needs? And remember: the right hot water boiler should improve serving times, beverage quality, and customer satisfaction. Design, functionality, and filtration are all points to be considered, along with ease of use, workflow, and energy consumption. Want to learn more about Marco water boilers? Contact us.